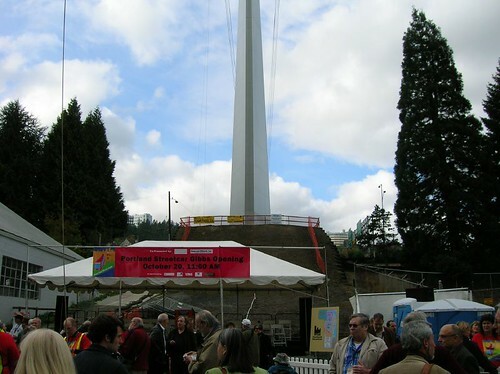 The opening of the Gibbs extension was an interesting juxtaposition between land transportation (Streetcar), aerial (the tram landing pictured here) and water (the barge being built just to the left of the tram landing at the Zidell plant). Three Leg Torso provides entertainment. Mike Houck, center, for once not thinking about Ross Island behind him. 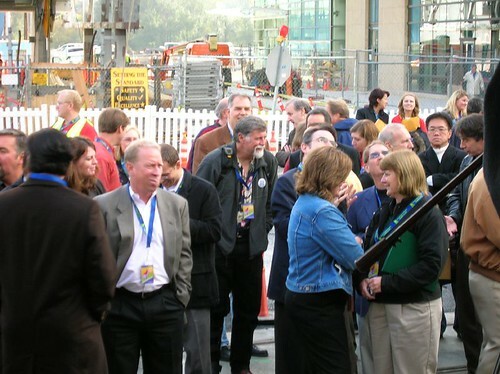 Loading the dignitaries, former PSU Dean Nohad Toulan center, TriMet GM Fred Hansen front right. 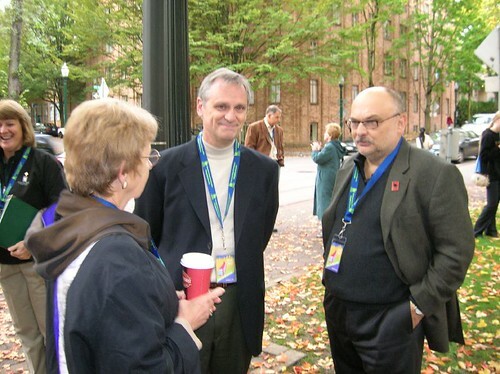 Lake Oswego Mayor Judie Hammerstad (left), Earl Blumenaur and Portland Streetcar Chair Michael Powell. A popular congressional hangout. 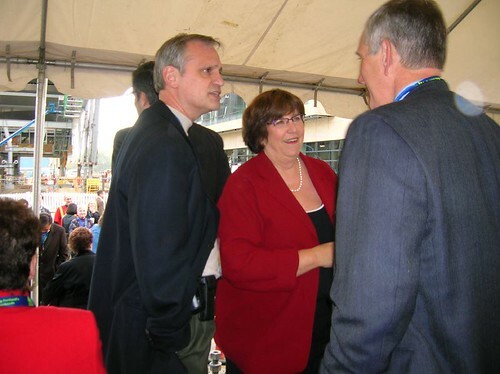 Congresspeople Earl Blumenaur and Darlene Hooley talk to former Transportation Commissioner Charlie Hales. Congressman David Wu, not shown, was also present. Celebrating Streetcar in the shadow of the tram tower. Streetcar (the next extension) will be part of the plaza outside the new OHSU building, which opens Monday. Lowell extension, opening August ’07, is already under construction. Washington County Commuter Rail Groundbreaking celebration! Fred Hansen said that there would be no way of attaching a second car to the SC. I knew that. Yet I have wondered if there could not be a somewhat lengthier train–in the future–with a fourth section in the articulation. A DeLuxe version. How about an upper level? Not enough room below the wires? Could it be like a double-decker bus (without the fish and chips advertising)? some european streetcars [Skoda I think] have a add on car, much like a trailer which could work here.. since the line is now about to be continuous and not dead ended.. Bunches of points to make. First – It was a kewl ceremony n all. I dug it. 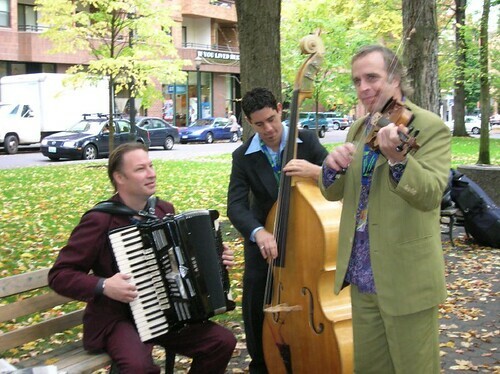 I enjoyed the music – very kewl band. Spoke to some of them shortly about musical tastes n such. Enjoyed the grand view of the tram and Two Streetcars sitting side by side (took pictures and posted on the ole’ blog). Second – Re: Ron Swaren – Why does there need to be a second car? Why a double decker version. Just run decent frequencies!! The cars are already here, they work just fine. Frequency is all we need. There would be plenty of room then for even a significant increase in passengers. Even if the law of demand was followed it wouldn’t fill up completely that way. 5 minute frequencies is all you need. If the demand is higher than that it would be insane not to just charge something to slightly decrease demand. i.e. – about a buck. It would also prevent another point below. Third – It was also funny to see some of the “dignitaries” squirm when the guy with the kitchen sink and trash can full of crap got on the Streetcar (Chris – you where on the other end of the car at the time. You probably noticed this guy. – he smelled REALLY bad). In my normal observations of humans I thought, “I gotta watch this scenario unfold”, and boy did I. In normal passive aggressive Portland fashion the dignitaries, attempting to appear unfased by this new stinky passenger scooted a little further away and made several comments under there breath as to his boarding. Three people on the rear of the Streetcar decided they’d walk because of the stinch at the next stop and got off at Harrison & 1st. 1 more person got off fussing about the stink. Finally the trash can man got off after a while. -> 50 cents would prevent this problem. Personally if I was a proprietor of the Streetcar Service I would want to carry people who add to commerce not detract. The trash can man wasn’t helping anyone, not contributing to commerce or the festive activities, just upsetting them and not giving a whits care. -> In the end just building up some extra passive aggressive angst with some people. Fourth – The speed the Streetcar makes between Gibbs and the previous stop is awesome! I stood and took pictures with the leaves on the ground near the slight turn and they look great. If only a better camera and better eye where to be had. That stretch will make for some GREAT media. >Chris A Great day was had by me. I agree, and have said in the past, that frequency of service would be the answer if the SC really takes off as a mass transit device. I had asked Hanson a question about the Milwaukie MAX proposal, since I have had doubts as to how cost effective it will be, compared to a two line SC route from Milwaukie. More frequent service would certainly be more customer-friendly during peak travel times. Mr. Hansen was the one who initiated this remark, I presume to continue the view that the large MAX is what is needed to link to the Milwaukie TC. I hope we don’t end up with largely empty MAX cars during the mid day. 1) I did indeed see the gentleman with the sink. I was too far away to smell him. At my end we were making jokes about everything being carried on the Streetcar, including the kitchen sink. The speculation is that it was stolen from a construction site. 2) Our cars are quite capable of being outfitted with couplers. But I have been told (this conversation happened well before my involvement) that the original agreement with the neighorhoods was that we would not run multi-car trains. Obviously it would have a big impact on the platforms, which in turn affects neighborhood issues. 4) East Side (our preferred terminology now is “The Loop”) and Lake Oswego are both moving forward. The Loop is now in the phase the Federal process calls “project development”, while LO is still in “alternatives analysis”. The optimists among us still hope to open The Loop in 2009 (although the terminus is still unknown, Oregon St., Morrison St. and OMSI being the possibilities). No projection on LO, although Mayor Judie Hammerstad wants to have a clear plan before she leaves office (term limits) at the end of 2008. Funny…out here in the East Side we call it “The Loopy”. As in building mass transit to where people aren’t, as opposed to, oh, I don’t know, building the streetcar up Hawthorne where people actually are and desperately need transit improvements. But, hey, y’all have fun ridin’ the train out to construction sites…and how many neighbors –not developers and politicians– were there for the ride? Quite a few actually. A high percentage of the folks who have already moved into the Meriwether turned out. 5000 units in Homer’s condo farm. Allow 1.5 people per condo. 7500 people / 100 people/trip = 75 trips to get them all to work outside of Homer’s hole. At the current 4 cars per hour that is 18 hours. Sure looks like the streetcar is the answer to our transportation needs. BTW I’m still waiting for the passenger mile data for the streetcar. Yes, the guy I stood by watching the speeches had bought a condo down there. 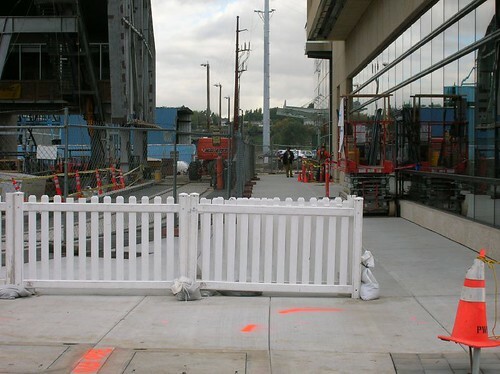 And as I noted, he and others have been kind of stuck down there–there’s not even a complete sidewalk up Moody. Overall, it was a nice celebration, and the car did indeed pick up a little speed leaving Gibbs. 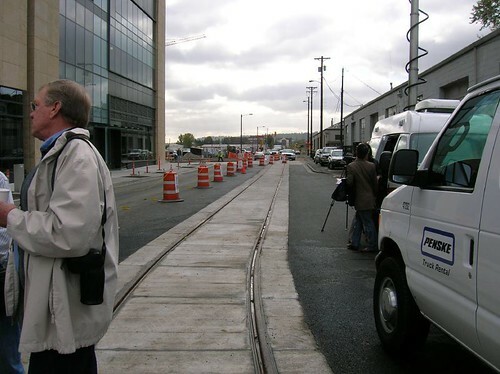 I found it interesting that they put the catenary end poles in the middle of the trackway. And was the “kitchen sink” guy on the north or southbound train? I left on the same car as Freddy [Hansen] et al. and herd them mention a “kitchen sink” but did not know what it was. A lot of those folks, in Homers Farm, will not have regular commutes: they’re working at home, have a varied daily itinerary, retired, independently wealthy ( as I wish we were), could bicycle or walk. Scratch that off your calcs. If the SC eventually goes past the Sellwood Bridge it is conceivable that headway will become less than 15 minutes. I would like to see a connection of the SC to Milwaukie. Then, if there were fifteen minute headways from both LO and Milwaukie, they become 7.5 minutes at Johns Landing. That’s why I have said that SC would be sufficient for most routes, even in our growing city. By alternating the destination, and connecting with other lines a functional grid would come into being, at least in the major destinations. Is the Streetcar a bit of fluff? Of course. But no one can force people to use mass transit, so it’s a concession to control development and prevent sprawl. Eventually the tax revenue will kick in. For now, I think someone should tackle the “free rider” problem: The SC is going through fareless square, has generously cheap monthly passes, people cheat–truly a “revenue challenged” enterprise at this point. 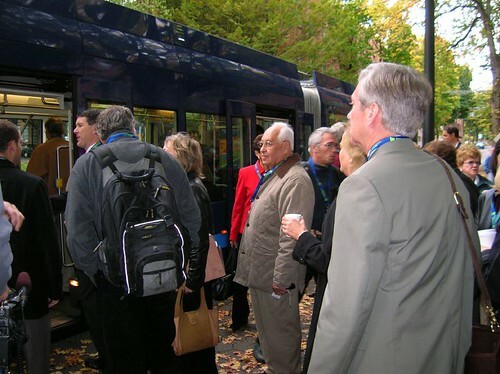 The streetcar design load is 154 persons, with a crush load of 221. For reasons I have stated elsewhere (sq. ft. per passenger), the real max load is closer to the 154 than the 221. Let’s just leave it at 150 to make the math easy. I’ll stick with your estimate of 7500 persons. Now, I don’t truly believe (I don’t think anybody does) that every resident is going to utilize the streetcar as a primary means of commuting, but let’s suppose that a very high percentage do, 20% for example. That’s 1,500 people. Using headways of 10 minutes, that’s 6 streetcars per hour per direction, or a peak load of 900 people per hour per direction. Can clear through all the streetcar users in less than 2 hours. Another chunk of people down there will use the tram (although I don’t believe it will be as many as projected in the long run), another chunk will not commute at peak hours (retired, non-working spouses, home-based businesses), and another chunk will do errands and shopping within the district or by streetcar during off-peak hours. That leaves us with perhaps 5,000 people who will travel by car. Assuming a car utilization rate of 1.5 persons per vehicle, that is about 3,300 cars leaving the area each day. Assuming that a high percentage of those trips are during peak hours (say 50%), that’s 1,650 cars. Over a 3 hour period that’s less than 10 vehicles per minute divided across all roads in the district. Doesn’t sound like such a nightmare to me. “Homer’s hole?” Must you always be so disparaging? 1) I’d double that speculation. I don’t know where he stole that trashcan full of random stinky crap though. 3) Yeah, the power to weight ratio is nice. In Tacoma I laughed one day as the bus I was on could barely get up the hill, I spoke the notion that the Streetcar should go up the hill instead… only problem is they have little actual grip to put the power to the ground. But yes, they’re snappy quick. …and I’m also curious about all these prospective messes too from the transit for south waterfront to the mall construction. I’m not hedging any bets because it looks REAL tricky. In both situations. One more note. I noted Bob R.’s comment about the STreetcar being able to add service to meet demand. This is not funtionally true, because by the statement itself, the system needs rolling stock and staffing levels appropriate to demand. During rush hour the demand is not currently met. Many are left standing or decide to walk it as things are now. That is not meeting demand. But then of course demand is highly unrealistic as there is no cost for the demand, so technically it will increase to infinity if there is no cost. Thus by needing more staff and rolling stock, a decrease in frequency so more cars come thru, and other such demands, the system doens’t meet those demands as it has no real expectation of doing so under the current funding/operational schema. …Thus another reason to add a fare. To cover operations and to also have realistic numbers to actually study instead of the “free” ride that the STreetcar currently is. …and the current fare doens’t count, we need a real and enforceable fare. I went down there today (Saturday), since I have a Monday-Friday office job like a lot of folks who can’t attend weekday morning/afternoon grand openings. Honestly, IMO, not much down there, and I have no real reason to ride the Streetcar down there. With all the talk of undesirable people using free transit service, one thing made me shudder… the signs on the onboard fareboxes stating all Streetcar rides are free all weekend. Honestly, I think it would’ve been better to have people at Gibbs check to see if people arriving had a valid fare – then if they didn’t, tell those people only that this weekend is a ‘fare holiday,’ and no fine would be issued. Announcing free fares to the masses only worsens the problem, and again IMO, will probably lead to future fare evasion (“but it’s only one stop!”). I believe the problem can be helped by abolishing Fareless Square in its entirety for all types of transit service – bus, light rail, and streetcar. 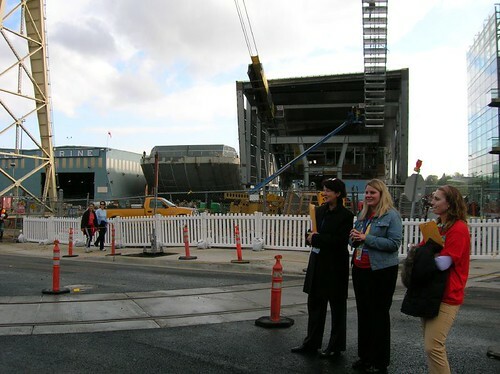 The operator of the particular train I was on was extremely informative – she explained that the trains were running a little off schedule due to the grand opening, so we’d be waiting for a few minutes for the Northbound train to clear the single track area before continuing to Gibbs. She also said that the portion was the only section of the Streetcar to use I believe she said it was girder tracks, and that the speed between Riverplace and Gibbs would be 30 MPH which is the maximum speed the cars are designed for. The information fair at the end of the line was nice (even for day number two) – most of the usual suspect groups, with the exception of an official TriMet presence. 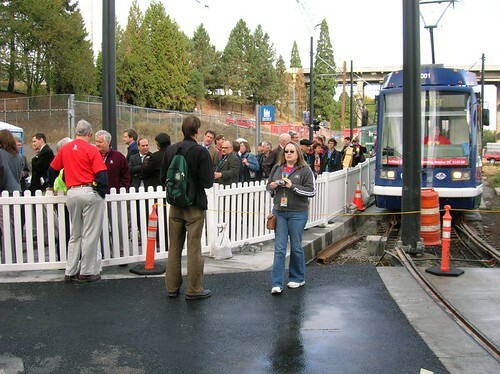 I know, I know – the streetcar is technically separate – but I believe they (TriMet) were at the Riverplace opening. One final thing about the Streetcar construction – I like it that the line is being extended in the “piecemeal” one-stop-at-a-time format. If it had to be constructed as an entire line from Downtown Portland to Lake Oswego – we’d all probably still be waiting to board a streetcar anywhere south of PSU. I’ll stick with your estimate of 7500 persons. ….., 20% for example. That’s 1,500 people. Shouldn’t that be BOTH roads in the area? Macadam & Moody. I hear Macadam is already pretty much full. Please compare 600 vehicles per hour (10 per minute, above) with the capacity of a lane of Macadam or Moody. I’ll try to come up with something better. How about yuppie playground South? Homers haciendas? Homer’s hollow? That’s it, I try Homer’s hollow for a while and see how it feels. …With all the talk of undesirable people using free transit service… I believe the problem can be helped by abolishing Fareless Square in its entirety for all types of transit service – bus, light rail, and streetcar. Wow. Let’s keep the undesireables off mass transit. Maybe instead of fare inspectors we can introduce clothes inspectors. Just who do they think this fancy-pants transit’s for anyway? Such a good system that you have to give it away free to millionaires. When do we get to see passenger miles figures for the streetcar? district, away from all the big office buildings. I’m not sure which big office buildings you’re referring to (Kruse Way? ), but if you develop a whole new neighborhood in the Foothills district of Lake Oswego, the ‘sensibility’ looks entirely different. Let’s see, developer pays for pass, resident pays developer for condo, including pass. I don’t see ‘free’ anywhere in there. On another note, I would like to point out a criticism I have of the streetcar. I believe that if service is to be extended to Lake Oswego, this criticism may need to be addressed: Noise. The noise is in two particular areas: 1. Inverter/electrical whine (which some have compared to a banshee, and which can be detected several blocks away once you know how to recognize it) and 2. some kind of major rattle in the suspension, perhaps of the track brakes? Now, noise is a relative thing, and certainly I’d rather have a streetcar moving by my house than a big diesel semi truck. But, the lake Oswego trackage currently runs in very close proximity to residences, sometimes right past people’s bedroom windows. In order to reduce local objection from neighborhoods, emphasis should be made on making the streetcar quiet, quiet, quiet. A quieter ride is not an impossible goal. In San Francisco, the F-Line runs a fleet of dozens of historic streetcars from different eras. You can clearly observe how some designs are quieter than others (sometimes older cars sound better than newer ones). Even if it is not possible to significantly improve the sound profile of the current fleet, procurement policies for future models should set maximum levels for various types of noise before bids are received. To add insult to injury, we rode a streetcar to Gibbs on Saturday and the vehicle we were in had a nice big flat spot in the wheel, which got really noisy as we hit the “high speed” stretch. That’s not a bad idea, Chris. Can I ask, though, what the charge is for that pass? Compared to the actual cost of that ride? Did we factor in operating costs? Every day people are turned away from getting on their #14 bus. In the meantime, we’re subsidizing Tram and Streetcar rides…it just seems the wrong way to sell mass transit. MAX to Lombard and transfer to the #6! Can I ask, though, what the charge is for that pass? A Streetcar annual pass is currently $75, going up to $100 in January. I’ve always thought it was too cheap, but given that so little of the line is outside fareless square, it’s been hard to justify raising it too much. It was $50 when the line opened in 2001, and I keep pushing for increases. On an operating basis, the subsidy for a Streetcar ride is probably similar to the subsidy for a ride on the #14 (JK will say the comparison breaks down on a passenger-mile basis, and he’s probably right). Capital of course is a different question. It seems that they are doing so many things wrong when it comes to public transit: another example was (replacing) the direct #5 to Jantzen Beach and Vancouver with the zig-zag #6, increasing the travel time–and don’t tell me that you can take MAX to Lombard and transfer to the #6! First-hand experience from earlier today! As the computerized voice said as the time came on the readerboard – “6 to Vancouver expected to arrive in 19 minutes” (of course, the emphasis is mine, the voice is emotionless – for those who don’t know, 6 is supposed to have 15-minute headways). 20 minutes later, 6 finally shows up. When I reached 7th St. TC, the 6 after that pulled in about 5 minutes later. In another thread here, I mentioned C-TRAN is thinking of running the 4-Fourth Plain from Van Mall to Delta Park, via Downtown Vancouver and Jantzen Beach. If they do, that’ll mark the end of C-TRANs payments to TriMet for the portion of the route between the two states, and the end of 6 to Vancouver, since TriMet must be reimbursed by the local agency anytime it travels outside its district. If/when that happens, 6 would most likely turn around at Jantzen Beach. I once heard a caller to the Victor Boc Radio Program when he was on KPAM that claimed two TriMet routes actually operated at a profit – 14-Hawthorne and the now-defunct 5-Interstate (yes, I knew a way to tie in an off-topic discussion point to the question at hand). Would love to know if that is or ever has been correct. P.S. Yes… I know there used to be a “TriMet Watchdog” site to post comments about service – I used to post comments like my first one there until some post verification started that my browser didn’t like. Whoo hoo! How do I get in a neighborhood with a streetcar? I know, I know…gotta buy one of Homer’s condos. Already live here, in one of our old, established neighborhoods, counting on mass transit?…forget it! 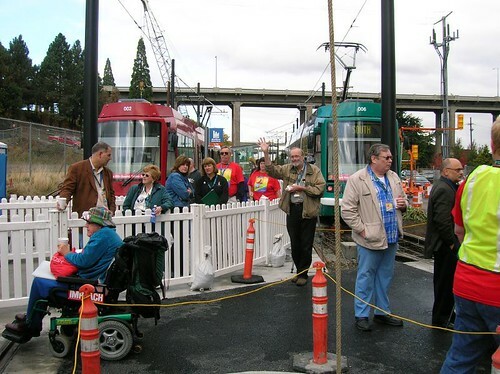 The streetcar passes are less money than TriMet passes because they work ONLY on the streetcar. If a person desires to use the transit system as a whole (transfer to any bus or MAX from streetcar), they should buy a TriMet pass rather than a streetcar pass. Personally, I would prefer to see more fare compatibility and interoperability… there is no real reason that the streetcar should be treated differently from any other TriMet route, from a passenger perspective. I fully understand the history of the streetcar project and why it developed semi-independently, but I hope that eventually it will become fully integrated (with route numbers and everything) with the rest of the TriMet system. Frank, the pass is cheap not because Streetcar serves new condos, but because so much of the line is inside fareless square. The folks in South Waterfront are only one stop outside the square. Do you really think they should or would pay $63/mo for a two-zone pass to go that one stop? You’d feel the same way if fareless square stopped one block short of where you are on the #14. Does the logic of fareless square need to be reviewed? Yes, and TriMet plans to do that over the next couple of years. P.S. Bob, the Streetcar is actually line 193 in TriMet’s data systems – not that it ever gets exposed as such (the MAX lines all have numbers too). The passes are cheap, the ride isn’t. Tri-Met is heavily subsidizing the streetcar’s operating costs, while my line #14, which I believe pays its own way, at least it comes closer, is offering ever deteriorating service. Just this morning, by the time my #14 ride came, there were 12 people at my bus stop at 22nd & Hawthorne. Most of those waited for the next bus. Standing crushed together isn’t a great way to start the week…while anyone catching the streetcar this morning from the Meriwether had, I suspect, a rather more pleasant time of it. Can’t I just be jealous? :-) But, also, from the policy point of view, we’re spending how much to build –and operate– streetcars to “promote transit-oriented-development”…while the loyal ridership in already dense neighborhoods (with affordable housing even) gets the overcrowded and inadequate bus service? Oh, yeah, and the ride back home over the Morrison bridge, that’s gonna be a hoot! Frank, if it’s any consolation, for the next Streetcar extension (to Lowell St.), the developers are paying about half the capital costs, up from about 17% on the original alignment. With the proven value of the Streetcar, we’re getting better at extracting that value from the developers. Perhaps it is time to reintroduce artics back onto the #14 route if the 40 foot buses are as crowded as Frank Dufay claims. Articulated buses don’t have to be lemons like the last bunch. Would they fit at the new mall stops? 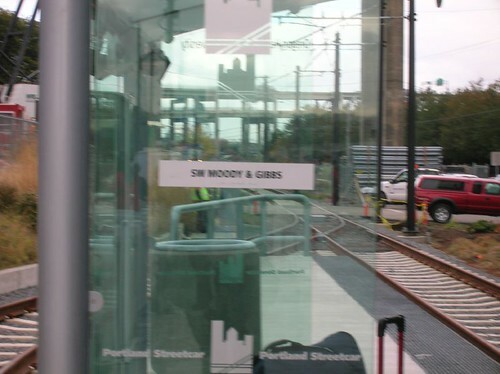 Congrats Chris on completion of another stretch of Portland Streetcar. My 97 year old father will be using it to get to his next eye doc appointment at the new OHSU clinic. BYW, its a short walk from the new terminus to the first stretch of riverside walk in South Waterfront that looks across to the little piece of Ross Island that “Dr Tribune” finally agreed to give the City. That walk is for everyone, not just SoWa residents. re the Streetcar Loop and eastside expansion…a number of “spokes” have been mentioned…Hawthorne, Broadway/Weidler, Belmont, Williams/Vancouver. I think the test should be 1. how much $ will developers/property owners put up via LIDs and 2. how much density along the line will neighborhoods accept. I think Broadway/Wiedler is the best option with plenty of right of way…at least to NE 24th…and 6 story condos already being built. The development and extension of Streetcars use in Portland is good. However if each new leg is supported by LID’s and neighborhoods to where it is not a burden on the whole of the system and the City, that is the type of winning policy we need. Regarding artics on the reconfigured transit mall, I forget who I asked at TriMet, but I was told that the new operational plan relied on a pretty standardized fleet size of 40′ buses. I’m sorry I don’t remember who told me this, or if it really is an official policy, but looking at the plans I think longer buses would disrupt the “board and then advance to signal” scheme because a 2nd bus couldn’t fully advance behind an artic. That being said, I have proposed here before that if demand rises to sufficient levels in the future, articulated buses could run on the LEFT side in what is to become the auto lane (or “multi-modal” lane as it is officially called). BRT-style buses with boarding doors on both sides could be used, and would not disrupt the operational pattern of 40′ buses and LRVs. Congrats on the new streetcar line extension. I can’t wait to ride it! I’d have to agree with Bob & Frank — the next priority for streetcar extensions, after the central eastside loop, could be Hawthorne, and the reasons would have to be overcrowding on the 14, and increased development. But, I’d also like to bring up the idea of a LRT line out Powell/Foster. This could complement a streetcar line up Hawthorne (which would then be free to terminate at 50th) by soaking up all the riders from the Foster corridor. The streetcar capacity would then be just for Hawthorne riders, which probably will fill most trains anyways. Finally — will a LID in Lake Oswego be used to pay for that extension? Will there be higher-density development occuring there next? Bob — go ahead and share your arcane new naming convention plan for all tri-met routes. 1. TriMet is an integrated system (fare compatible) that offers multiple types of service (Light Rail, Streetcar, Bus). 2. As multiple streetcar routes go online, just calling the system “Streetcar” won’t help. 3. Using colors for streetcar lines would blur the distinction between MAX and Streetcar too much. 4. When it comes to routing and stop distances, streetcars function more like a bus, so a designation system for streetcars should be similar to a bus but easy to tell that the service is a streetcar. 5. Streetcar designations, because of similarities to bus, should reflect the numbering of similar bus service in the area. 6. MAX color designations are fine, but just putting colored dots on a sign can confuse the visually impaired/color blind people… and I’ve seen many tourists ask what “color” is a particular train, not knowing that the rollsign color itself is the clue. MAX designations should be improved to eliminate these ambiguities. 1. Add letter codes to MAX, keeping the colors. Inside each colored circle on signage, also include a letter. This will improve matters for the color blind, and will make it easier for new users to the system to realize they need to look at the rollsign. Several other cities with rail transit use letter designations, so the concept is not new. We can come up with a number of colors before running out of single letter designations, but should avoid ambiguity (for example, a “Gold” line wouldn’t fit in this scheme.) We can do “P” Purple, “O” Orange for future lines, for example. 2. Number the streetcars similar to buses, but put an “S” in front of the number. The “S” indicates a streetcar level of service. This is similar to putting an “X” for “Express” service… Portlanders are already used to letter codes mixed with numbers. For example, a streetcar to Lake Oswego could be called the “S30″… (A number of the 30 series of buses serve that area, and 30 is available.) Streetcar numbers chosen should not duplicate bus numbers. If a streetcar route is constructed along Hawthorne to replace the #14 bus someday, the number could simply become “S14”. That’s the basic plan… what do you think? In fact the plan is to use colors (non-primary ones) for multiple Streetcar lines (starting with ‘The Loop’, i.e., eastside). I suspect Bob may be right that this will not be workable. I’ll make sure the citizens advisory committee looks at this closely before anything gets implemented. Chris, thanks for the info… Let me know if you’d like me to put together a handout or make a presentation to the CAC. I’ll get in touch when it’s time to fertilize. Re colors: Interesting point, Bob. My only issue is that TriMet got rid of the x’s (express) and s’s (shuttle) not too long ago in order to simplify the system. Using letters for rail is not a bad idea. Just like San Fran does. Why can’t we have a system with designations that are more specific to Portland, instead of copying what every other public transit agency the world over has done? Why can’t we have a salmon line, a cascades line, a pacific line, a willamette, columbia, hood, mckenzie, etc lines for our rail transit? Give ’em colors too, for easy recognition – but beware of the blind AND color blind (10% of population?). Buses, of course, would stay numbered because that would be way too confusing. Having a naming convention similar to what “every other” agency has done is simple: A high proportion of business travellers and tourists utilize transit. The system should be simple to understand to a newcomer. Regarding the blind and color-blind, that is precisely why I proposed adding letters that correspond to the current colors. We have the advantage of a nearly completely unified, integrated system, unlike some regions with multiple incompatible overlapping systems (San Francisco’s BART, CalTrain, MUNI, VTA, SamTrans, etc. comes to mind)… the naming system should reflect that unity with simplicity.